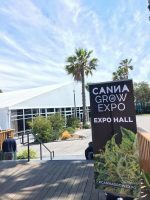 I recently attended the CannaGrow Expo held in Denver, Colorado. It was a fantastic event, per usual, and I was pleasantly surprised to see a number of presentations by industry experts where the central themes were sustainability and environmental stewardship. I was particularly struck by Adam Maher’s presentation, where he discussed the merits of micro grid technologies and the ease in which they can be coupled with renewable energy modalities, such as solar. His sentiments really resonated with me, particularly with respect to the long-term implications of cannabis cultivation sweeping across North America. 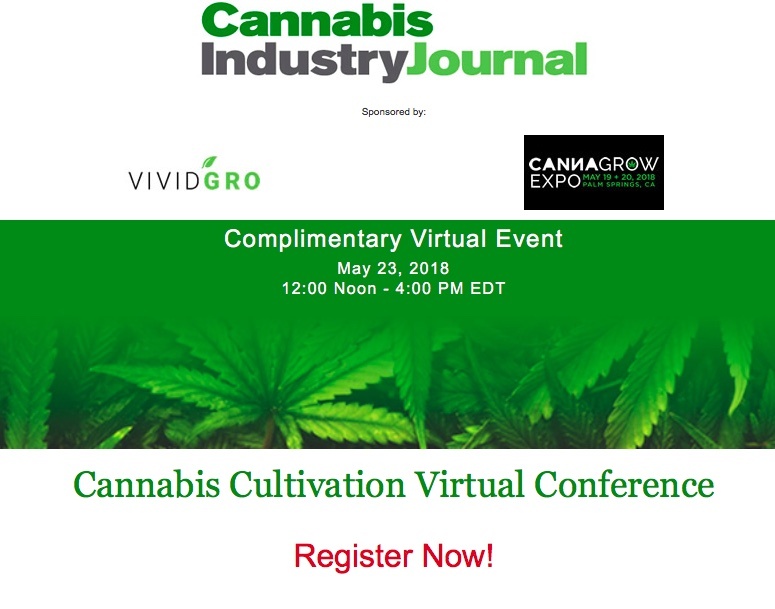 Considering that cannabis represents the new frontier of modern medicine and its societal acceptance is rapidly spreading, there is a growing impetus for cannabis professionals to implement technologies that will enhance the sustainability of their operations. These pertain to, but are not limited to, power generation and lighting, both of which are integral components to any indoor cannabis cultivation facility. Not only can the utilization of energy efficient technologies (i.e., solar panels and LED lights) help our planet that is struggling mightily to neutralize the influences of anthropogenic climate change, but it can also add value to the bottom line. That’s right: environmental stewardship, product quality and financial success are not mutually exclusive in the cannabis industry. For example, the utilization of solar panels and/or a micro grid can have a relatively rapid payback (<6 years), while the hardware itself adds inherent value to any cannabis property/operation. This is particularly relevant in an emerging market where acquisitions are common and the management of asset value is a harbinger of success. Secondarily, the use of LED lighting technologies to produce ultra-premium cannabis is another piece of low-hanging fruit that can be picked to add value. For example, 1st and 2nd place in Arizona’s 2017 ERRL Cup were awarded to flower that was grown under LED lights designed by the Tall Trees LED Company, where the total cannabinoid levels exceeded 32% and a wide variety of terpenes were detected. These results, coupled with the fact that LED lights can provide full spectrum light that requires less energy and produces less heat than HPS lights, make the adoption of LED lights a simple choice for the environmentally conscious and financially savvy operator. As we continue to move towards more states becoming cannabis powerhouses, and a potential federal rescheduling, the industry must continue pushing the operational equilibrium towards more resourceful technologies. Of course there is always going to be a perceived activation energy or threshold that must be transcended before the adoption of new technologies can be successfully accomplished with confidence. This is completely normal and is usually associated with the initial capital that is required to acquire such technologies, and/or fears that such an investment won’t bear fruit. However, there is currently enough data to indicate that technologies like solar panels and LED lights are a smart financial choice for any cultivation facility where there is sunlight and electrical outlets. In summary, I would strongly encourage any operator to evaluate the sustainability and environmental stewardship of their business, especially if they anticipate spreading the holistic gospel of cannabis medicine for many years to come. You are already doing a tremendous service for those who depend on cannabis medicine and now is the time to continue your noble pursuit while taking care of Mother Earth and paying it forward to our subsequent generations. 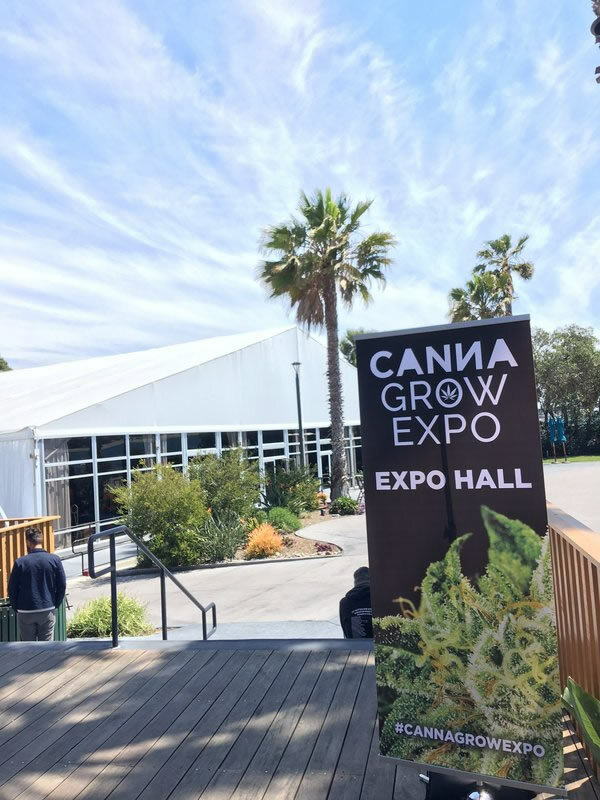 The CannaGrow Conference & Expo, held in San Diego on May 7th and 8th, educated attendees on the science of cannabis cultivation. The conference brought subject matter experts from around the country to discuss cannabis breeding and genetics, soil science and cultivation facility design. 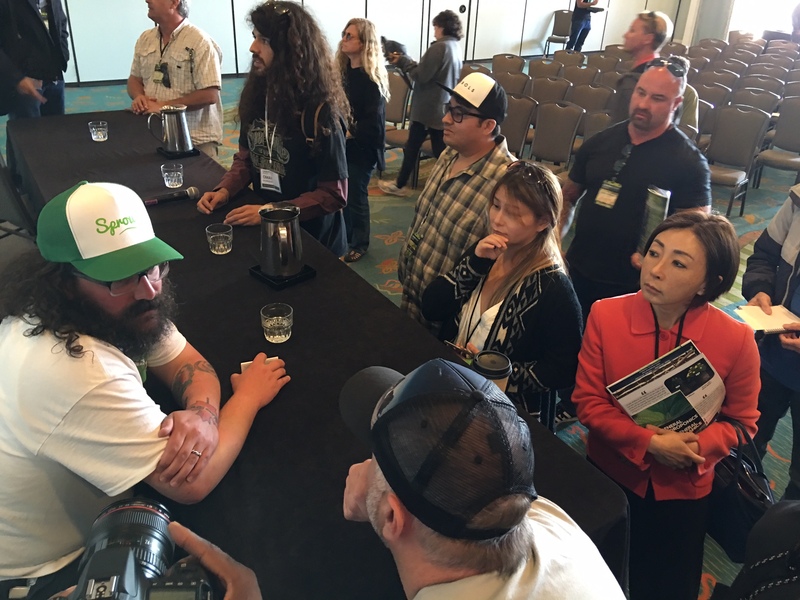 Discussions at the conference delved deep into the science behind growing while providing some expert advice. 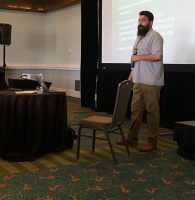 Drew Plebani, chief executive officer of Commercial Cultivator, Inc., gave a comprehensive review of soil ecology and how understanding soil fertility is crucial to successfully growing consistent cannabis. “Soil fertility is measured by laboratories in terms of soil minerals, plant-available nutrients, percent of organic materials, pH levels and most importantly the balance of the soil’s chemical makeup,” says Plebani. “There is no silver bullet in soil ecology; increasing your soil fertility comes down to understanding the composition of soil with analytical testing.” Plebani went on to add that soil systems for cannabis need to be slightly fungal-dominant in developing an endomycorrhizal system, which is optimal for cannabis plant growth. Plebani notes that growth and viability are reliant on maximum root mass. Tom Lauerman, colloquially known as Farmer Tom and founder of Farmer Tom Organics, kicked off the conference with an introduction to cultivation techniques. Lauerman also delved into his experience working with federal agencies in conducting the first ever health hazard evaluation (HHE) for cannabis with the National Institute for Occupational Safety and Health (NIOSH). Through the HHE program, NIOSH responds to requests for evaluations of workplace health hazards, which are then enforced by the Occupational Safety & Health Administration (OSHA). 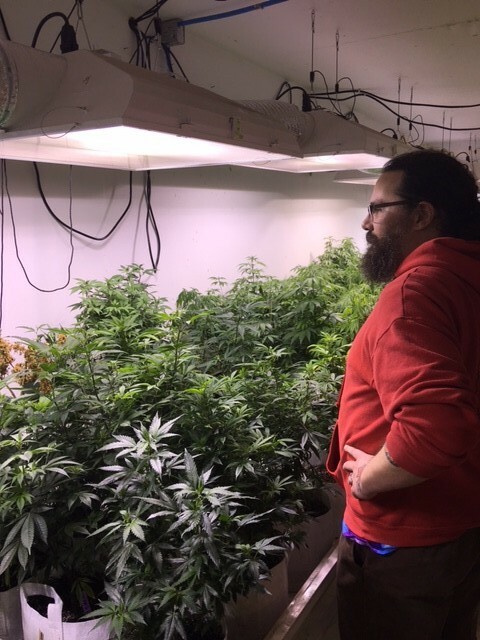 Lauerman worked with those federal agencies, allowing them to tour his cultivation facilities to perform an HHE for cannabis processing worker safety. “I was honored to introduce those federal agencies to cannabis and I think this is a great step toward normalizing cannabis by getting the federal government involved on the ground level,” says Lauerman. Through the presentation, Lauerman emphasized the importance of working with NIOSH and OSHA to show federal agencies how the cannabis production industry emerged from the black market, branding itself with a sense of legitimacy. Attendees flocked to Jacques and his team after the presentation to meet them. 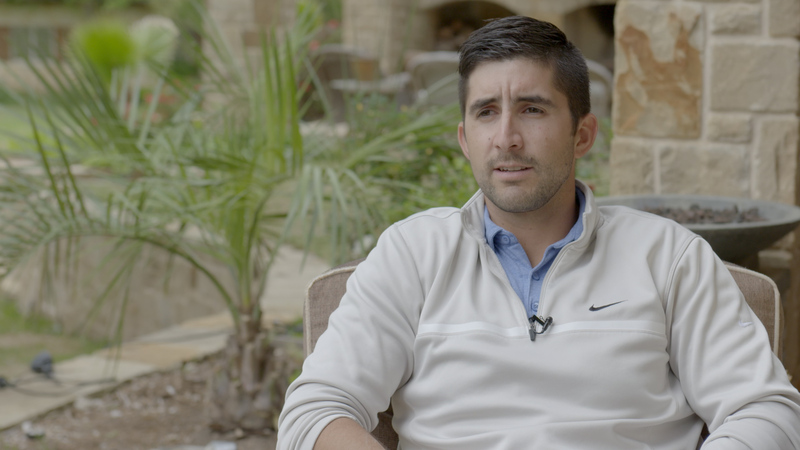 Adam Jacques, award-winning cultivator and owner of Grower’s Guild Gardens, discussed his success in breeding CBD-dominant strains and producing customized whole-plant extractions for specific patients’ needs. “I find higher percentages of CBD in plants harvested slightly earlier than you would for a high-THC strain,” says Jacques. “Using closed-loop carbon dioxide extraction equipment, we can use multiple strains to homogenize an oil dialed in for each patient’s specific needs.” As a huge proponent of the Entourage Effect, Jacques stressed the importance of full plant extraction using fractionation with carbon dioxide. He also stressed the importance of analytical testing at every step during processing. Hildenbrand discussing some of the lesser-known terpenoids yet to be studied. 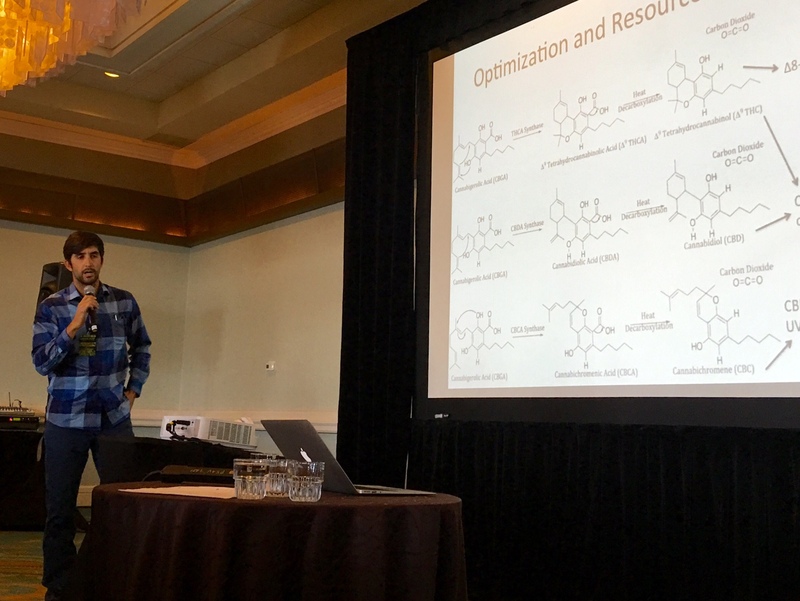 Zacariah Hildenbrand, Ph.D., chief scientific officer at C4 Laboratories, provided the 30,000-foot view of the science behind compounds in cannabis, their interactions and his research. With the help of their DEA license, he started the C4 Cannabinomics Collaborative, where they are working with Dr. Kevin Schug at the University of Texas-Arlington to screen various cannabis strains to discover new molecules and characterize their structure. 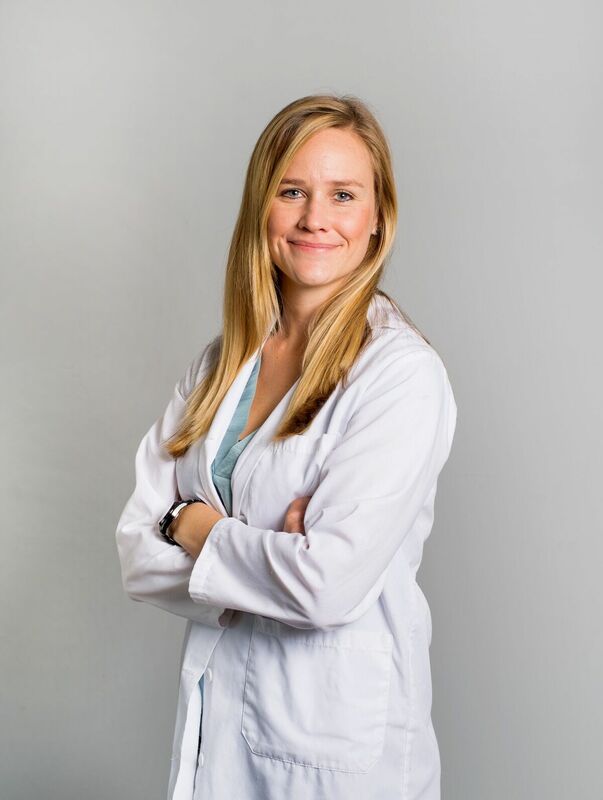 “Secondarily, we are using gene expression profiles and analysis to understand the human physiological response and the mechanism through which they elicit that response,” says Hildenbrand. “As this research evolves, we should look to epigenetics and understanding how genes are expressed.” His collaborative effort uses Shimadzu’s Vacuum Ultraviolet Spectroscopy (VUV), and they use the only VUV instrument in an academic laboratory in the United States. “Pharmaceuticals are supposed to be a targeted therapy and that is where we need to go with cannabis,” says Hildenbrand. Him and his team at C4 Laboratories want to work on the discovery of new terpenes and analyze their potential benefits, which could be significant research for cannabis medicine. Other important topics at the conference included facility design and optimization regarding efficient technologies such as LED lighting and integrated pest management.